Fran - This is a really interesting question. 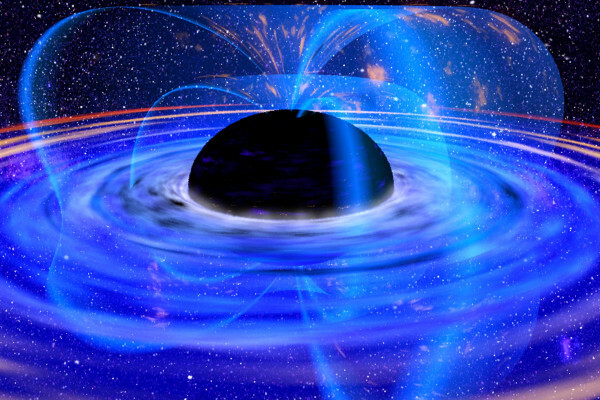 The first thing I want to say is it is actually possible to survive for a short period inside a black hole. The entrance to the black hole would usually be defined by what we call the event horizon, which is the point where if anything, including light, crosses the event horizon it can never come out again because the black hole’s gravity is too strong. Chris - That’s why it’s called a black hole, isn’t it? It’s bending space so much that not even light can escape. Chris - The light falls into the hole and never comes out again. Fran - Yes. Once we cross the event horizon we’re doomed to fall into the black hole. But, for all we know, we could be crossing an event horizon of a very large black hole right now and we wouldn’t necessarily feel anything. But, if you tried to look out of the black hole to other things, for example, the light would be so distorted and bent that you wouldn’t really be able to see a clear image of anything outside of the black hole. Chris - So if I went in backwards and I’m looking at planet Earth as a blue marble in space in the distance. Let’s imagine I could see it that clearly. As I went over the event horizon of the black hole, because there’s still light coming in with me from the Earth that light would begin to stretch, would it, and I’d see a sort of distorted image? Fran - Yeah. It would be warped, colours would be warped as well because the black hole sort of stretches the light. Chris - So the answer to the question is then, is you would see it, but you wouldn’t see it clearly? Philipe - So would it be a bit like, going back to the goldfish, a goldfish looking at us through air? Fran - Yeah, maybe. That’s nice how it all links up isn’t it? Chris - Anyone would think someone put this show together. Previous What is déjà vu? Next QotW - Are aliens edible? How Fast do Lap Cats Lap?